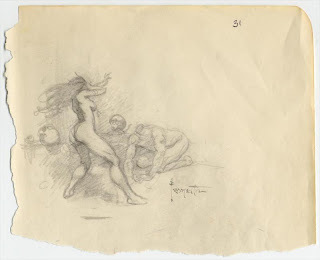 One of the myths that sprang up around Frank Frazetta (and there were and are many) was that he didn't do roughs, that he just sat down and drew or painted spontaneously without any forethought or preparation. That, of course, is all hooey: Frank was a constant doodler and he created roughs for virtually everything he ever did (we gathered a number of his sketches and comps in Rough Work). How an artist "gets there," how they problem solve and noodle out a piece, is perhaps the most fascinating part of the process—and that fact is clearly proven by the marvelous examples Jesper, Justin, Greg, Donato, Dan, and Eric have posted here in recent weeks. So, for those that are curious how Frazetta "got there," I thought I'd quickly show some of the thumbnails Frank did in preparation of drawing an illustration for the 1973 Science Fiction Book Club edition of The Chessmen of Mars by Edgar Rice Burroughs.